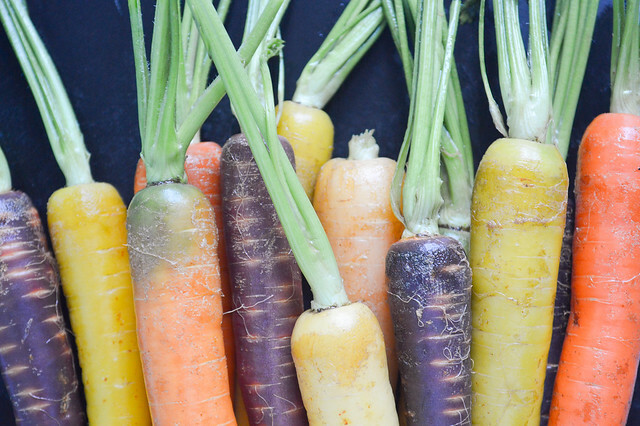 There’s something amazing about Rainbow carrots! I don’t know why, but I like them so much better than regular carrots. Kind of like how Heirloom tomatoes are tastier than regular ones. There’s something about their beautiful colors, that make them much greater. I want to cook with them all the time because they add such a nice touch to any dish. They’re simply vibrant! Today I decided to share a very simple dish with you, that’s sure to satisfy everyone around the table. It’s tasty, beautiful, and ridiculously easy to make. I’m serious. It requires almost no time in the kitchen! Now how amazing is that after a long day at work? Pretty sweet, right? Roasted carrots are the only cooked carrots I’ll have. I love how tender they become, with their slightly caramelized edges. Adding ham at the end of the roasting process allows the fat to melt and the meat to become slightly crispy around the roasted vegetables. 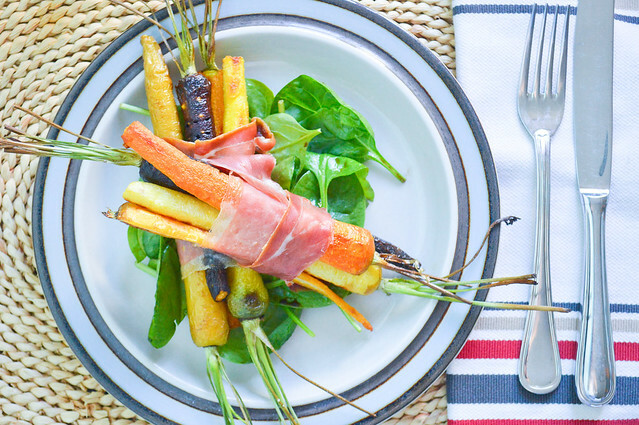 The sweetness of the carrots balances out the saltiness of the ham perfectly, almost reminding me of one of my Italian favorites: “prosciutto and melon” (ham and cantaloupe)! You could also probably grill these on a barbecue, and though I haven’t tried it yet, I’m sure it would be as delicious! Bon appétit! Meanwhile, peel the carrots, cut the roots at the bottom, but keep about 2in of the stems. Cut them in half, toss with olive oil, and place them on a baking sheet lined with parchment paper. Bake them in the oven for 20 minutes, tossing them around halfway through. Next, lower your oven’s temperature to 400°F, cautiously wrap about 3-4 carrot halves in each slice of ham, and let them roast for another 3 minutes. The ham will slightly melt, and keep everything together. Serve each “wrap” on top of a bed of seasoned greens, like spinach for exemple. Enjoy! TIP: This recipe is also delicious with Asparagus, and it’ll take less time! Pendant ce temps, pelez les carottes, coupez-en les racines, mais gardez le haut avec quelques tiges. Coupez les en deux, ajoutez la cuillère d’huile d’olive et mélangez bien pour recouvrir chaque légume. Disposez les sur une plaque de cuisson recouverte de papier sulfurisé, et mettez les à cuire pendant 20 minutes, en les retournant à mi-cuisson. Puis, baissez la température du four à 190°C, enroulez chaque tranche de jambon autour de 3-4 demie carotte, créant ainsi des petits “fagots”, et remettez au four pendant 3 minutes. Le jambon va fondre légèrement, ce qui permettra de bien tenir les carottes. Servez ces “fagots” de carottes sur un lit de salade, comme des pousses d’épinard par exemple. Bon appétit! TIP: Cette recette est aussi délicieuse avec des asperges, et prend moins de temps de cuisson! 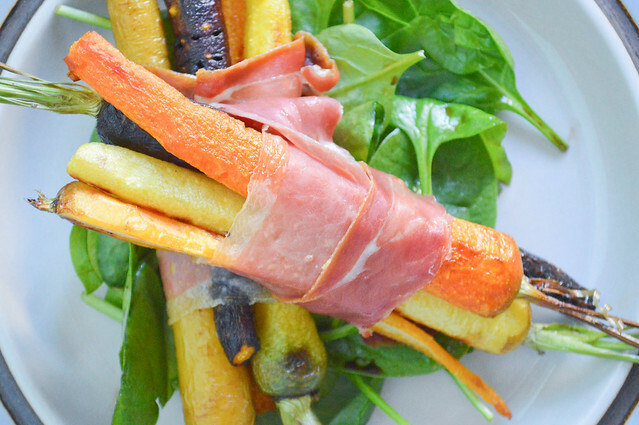 Posted on July 3, 2014 July 6, 2014 by julieadPosted in Dinner, Lunch, Main, Recipes, SidesTagged baked, carrots, dinner, ham, healthy, jambon de bayonne, olive oil, prosciutto, quick, rainbow carrots, roasted, vegetables. That top photo of the carrots is absolutely stunning! Love this! Thanks! Was about to say the same about your second Raspberry Muffins photo. Great lighting and colors, beautiful! I don’t know how i feel about this. But i want to try it so badly! That looks sooo good. Having trouble finding the black ones this time of year. This looks amazing! Even just looking at it makes me hungry. 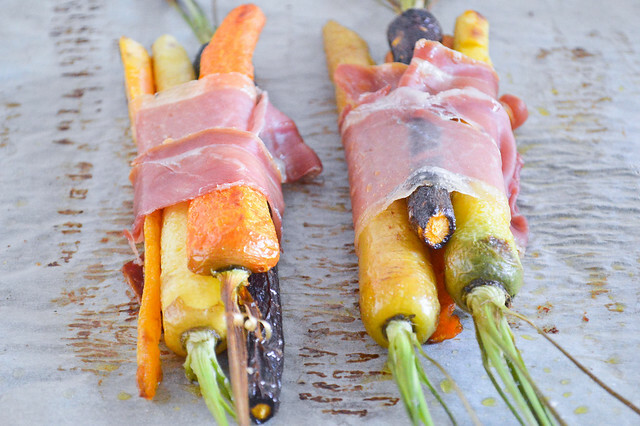 These look totally delish, almost like the bacon wrapped asparagus I’ve done before. It looks delicous, I want to try it! My 2 favorite foods: carrots and bacon. I’m going to try this. I don’t think I’ve ever seem carrots in so many colors. Yummy! I need to learn how to cook one day! These are the best carrots I’ve seen, ever! So tempted to try this out. They make my mouth water. Looking forward to trying this recipe! Thank you. Yum yum this looks very nice. This looks simple and delicious. Would love to give it a try soon. Thanks for sharing! The colours really make this dish POP – it’s too bad that multi-coloured vegetables aren’t more redly available to the average consumer. I’m going to try them this weekend!! 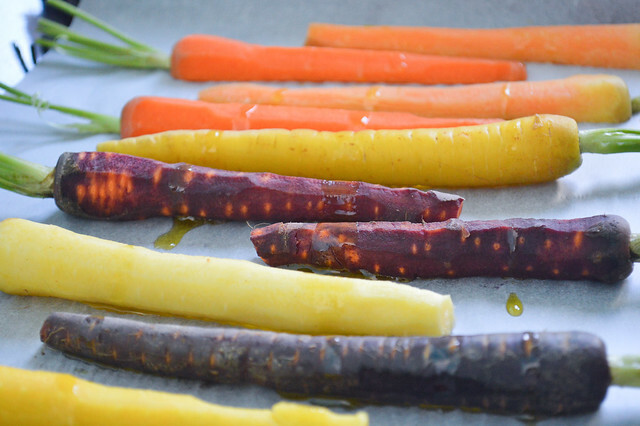 This is a great way to serve carrots in multiple dishes….Happy eating! Anyone who loves purple carrots is my hero! TASTE THE RAINBOW!!!! Just gorgeous. Keep it delish!